Andy Peaks knows a thing or two about having a run in the FA Trophy. Back in the 1994-95 season, Peaks was part of the Rushden & Diamonds side, who were in the Southern League Premier Division at the time, who went all the from the first qualifying round to the two-legged semi-final. After a memorable run, there was heartbreak as they were beaten 2-0 by Woking in the second leg having beaten them 1-0 in the first game at Nene Park thanks to Aidy Mann’s goal in front of over 4,000 people. Peaks, of course, is now at the helm of AFC Rushden & Diamonds and they are preparing to get their Trophy campaign under way when they take on Kidsgrove Athletic at Hayden Road tomorrow (Saturday). And while plenty has changed in the last 22 years, Peaks is adamant that there is an opportunity in this particular competition. “The FA Trophy is a great competition, any competition that culminates in a Wembley final has to be good,” the Diamonds boss said. “I was fortunate to get to a semi-final with Rushden when we played Woking over two legs, I think I got man-of-the-match in one of the games! “We were in the Southern League at the time so it goes to show that anything is possible. “You need a bit of luck with the draws, of course, but if you get things right on the day then you can go far. “And I will certainly be saying that to our players. “We believe we are a decent team and I think we have been showing that for a while now. Kidsgrove certainly won’t be unfamiliar opponents for Peaks and his players. The two sides met in the Evo-Stik League South last season with Kidsgrove ending Diamonds’ long unbeaten run with a 5-2 away success before Peaks’ team avenged that with a 1-0 win on the road later in the season. 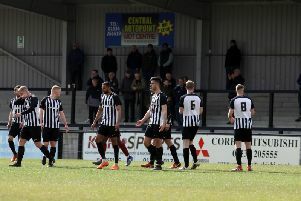 And the manager, who has seen his team put together an unbeaten run of four matches in all competitions, knows his side will need to be at their best if they are to go through to first qualifying round clash at either Newcastle Town or Soham Town Rangers. “We know a fair bit about Kidsgrove and they are a dangerous team, we found that out to our cost last season,” Peaks added.